Artdeco is launching the new Divine Nail Colour collection; 14 on trend nail colours, including Mauve Azalea, Gentle Peony, Walnut Wood and Boulder Grey (shown here clockwise from top left). 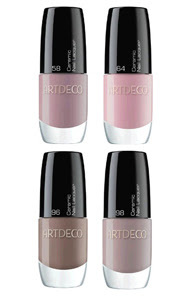 ARTDECO’s Ceramic Nail Colours, priced £9.30, contain fine ceramic particles to provide intense colour and long lasting shine. Other colours in the new collection include: Pink Daylily, Soft Milkweed, Breezy Rose, Mellow Macadamia, Faded Flower, Milky Russet, Brown Praline, Powder Ash, Blue Grey, Froggygrey. They launch in January/February next year stockists will include http://www.garden.co.uk/, Fenwick (Brent Cross) and Hoopers Department Stores nationwide. Simply gorgeous shades - I can't wait for these, can you?